I’m planning to make my own first aid kit for my dorm room so I thought I would make a list of things to put in it… and then I thought, “Why not make this an article for Kill Jill?” and here I am. Unless you’re attending The Arizona School of Snake Ssssscience, you likely won’t need any snake anti-venom included in your first aid kit. This article includes a list of things you would need if you’re living in a dorm or just away from home for the first time. Dollar stores offer some of these items but you will have to go into the drug store to get the rest. Most of these items are fairly priced, so no worries. First, you will need a box. This would be one of those dollar store purchases I mentioned before. Dollarama has a nice assortment of boxes with lids. Make sure the box is sturdy, has a cover and is big enough to fit everything you need to put inside. However, make sure it’s not too big, as you may need to store it under your bed. 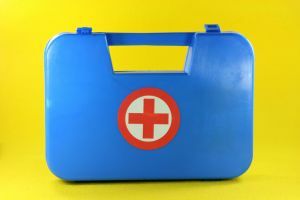 When I get mine, I plan to personalize my first aid kit box, like I do with as many things as I can. Add stickers, throw some paint on it or maybe glue on a few buttons. I plan to cut some pictures from some magazines and glue them all over. Whichever way you plan to decorate, leave room for the label on the lid: “First Aid Kit”. Small scissors. Small but sharp. Mustache trimming scissors would be a good kind to get. Thermometer. (And no, I don’t mean an alcohol thermometer.) It doesn’t have to be special digital thermometer or anything. Just a simple one will work just fine. Package of tissues. Since a whole box of tissues takes up too much room, I recommend those small travel packs that come with, like, 5 tissues inside. Gauze. You can usually get gauze in rolls. Medical tape. Because Scotch tape won’t stick to skin for very long. Q-Tips. Despite doctors urging people to not use these to clean their ears, people still do, as they are the best things ever created in the history of the world. Vaseline. You can get really small jars of Vaseline at drug stores, sometimes with the travel shampoo stuff. Polysporin. It has been my experience that Polysporin is the miracle ointment. Buy some. Like, now. Tylenol/Advil/Midol/etc. Make sure to include your choice of hangover headache relief medications. Want me to add anything else to the list? Comment on this entry and I’ll add it. Wanna see how my own kit turned out? This entry was posted on June 5, 2008 at 6:31 pm and is filed under Articles, College Stuff, Dorm Life, How-To, Tips. You can follow any responses to this entry through the RSS 2.0 feed. You can leave a response, or trackback from your own site. I am long out of college and I never gave thought to this concern then. This is a great safety precaution idea. Good stuff, bookmarked for further reading. Uh… I guess. I just ask you link back to the post AND the blog. Thanks.